Oaktree is a leader among global investment managers specializing in alternative investments, with $101 billion in assets under management as of December 31, 2016. The firm emphasizes an opportunistic, value-oriented and risk-controlled approach to investments in distressed debt, corporate debt (including high yield debt and senior loans), control investing, convertible securities, real estate and listed equities. Headquartered in Los Angeles, the firm has over 900 employees and offices in 18 cities worldwide. As Oaktree’s Portfolio Analysis and Reporting team (“PAR”), a sub-department of Client Relations, continues to expand its suite of client and portfolio management reports, they are seeking an individual to help produce reports as well as engineer and implement operational production routines to ensure that high quality reports are delivered accurately, consistently and on time. 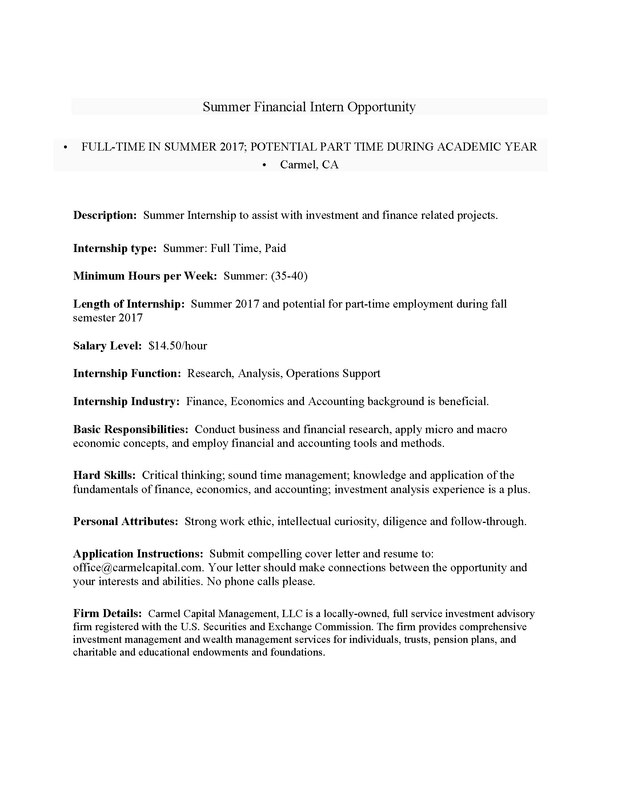 All interested candidates should submit compelling cover letter and resume to: office@carmelcapital.com. Your letter should make connections between the opportunity and your interests and abilities. No phone calls please. Leadership Conference registration pages will be posted soon. Check back!